Eleven entries from three districts descended on Guildford's water at Abbey Meads, Chertsey hoping to start the year's nine open events with a bang. However, the weather was really unkind, as it was cold, it rained relentlessly all day and worst of all there was little or no wind. However that didn't stop RO Martin Crysell and Peter Dunne from running 10 races for which they were thanked heartily by the prize winners. 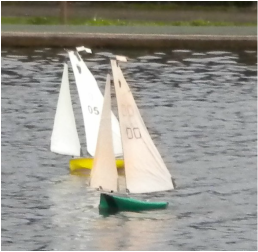 These little boats usually sail well in light airs, but there was a lot of drifting sideways instead of going forwards for much of the time, because there was insufficient wind to drive them forwards. Despite this, the boys from Abington Park coped well with the conditions better than most to secure all the podium places. Peter Jackson led the way with a win in the very first race, sailing his IBEX. The most remarkable performance however was that of David Wilkinson, who had revived his American Bill Hagerup BACK BAY FOOTY design. *also available as the Nipper on this site. This is a simple hard chine box shape made from balsa with foils of suitably reinforced similar material. Initially with a balanced una rig, it did not perform well, so David changed to his beautifully made and set up swing rig, similar in concept to other boats and transformed the performance in the lightest of airs. He was often seen streaking away from the starting line leaving the fleet behind to get two wins before lunch. However, John Burgoine sailing an ICE also gained two wins and was more consistent, to head the lunchtime leader board with just 7 points to David's 9. By this time the two junior competitors Oliver 8 and Nathan 5 found the cold and the wet too much and retired from the event. After lunch there was a touch more breeze, with puffs that allowed the boats to heel briefly and make some recognisable progress to windward and downwind. John continued to be consistent with another win and three more thirds, but not consistent enough, as he was beaten on three occasions by Keith Bell sailing an IBEX, with two seconds and two wins. This brought the scores level and Fred's Big Toephy went to John on count back, as a result of his three wins. NovICE trophy - Keith Parrott, (best skipper who has not been on the podium in previous Footy events).